World Book Day celebrations have included children and staff having fun dressing up as book characters. Parents and Governors attending Good Work Assembly were treated to a range of super work from Alice in Wonderland, Dorothy, The Dark Knight and The Queen of Hearts- to mention a few. Children have also been taking part in an Extreme Reading competition. We have received some fabulous entries including Freddie here reading whilst horse-riding: an impressive effort I’m sure you’ll agree! As authors ourselves, children are writing and making our own picture books for us all to enjoy. 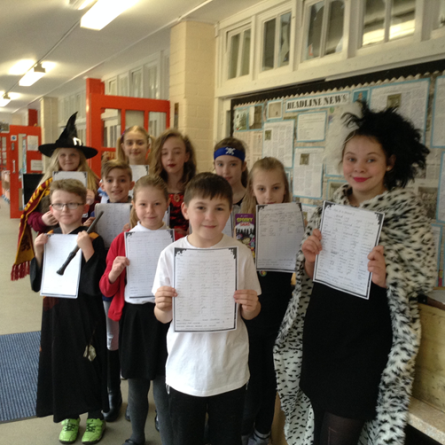 Some children from Neptune Class have taken the opportunity to enter a competition and have written winning spooky sagas, which have been chosen to be published in the next Young Writers book. We are very proud of them and school will have a copy of the book in the library soon.